I was first ‘encouraged’ to use trekking poles when Tim and I walked the Salcantay Trail in Peru in 2006. It took a long time for me to become a fan of trekking poles and I finally purchased a pair – yes two – for our trip to Bhutan in 2012. I am firmly in the two-pole category! And I know trekking poles can sometimes make you look a little silly, like you’re trying too hard to impress or just a little out of place as you build your fitness while pounding the urban walkways in full gear. But trekking poles also serve a great purpose and are well worth thinking about. The main benefits of using trekking poles are to reduce stress on joints, and to provide greater stability and balance. I use them on multi-day hikes but not during every minute of the day. My original poles saw a lot of hiking and took a big beating – and only one has survived. So, when it came to purchasing some new ones they of course had to be purple. 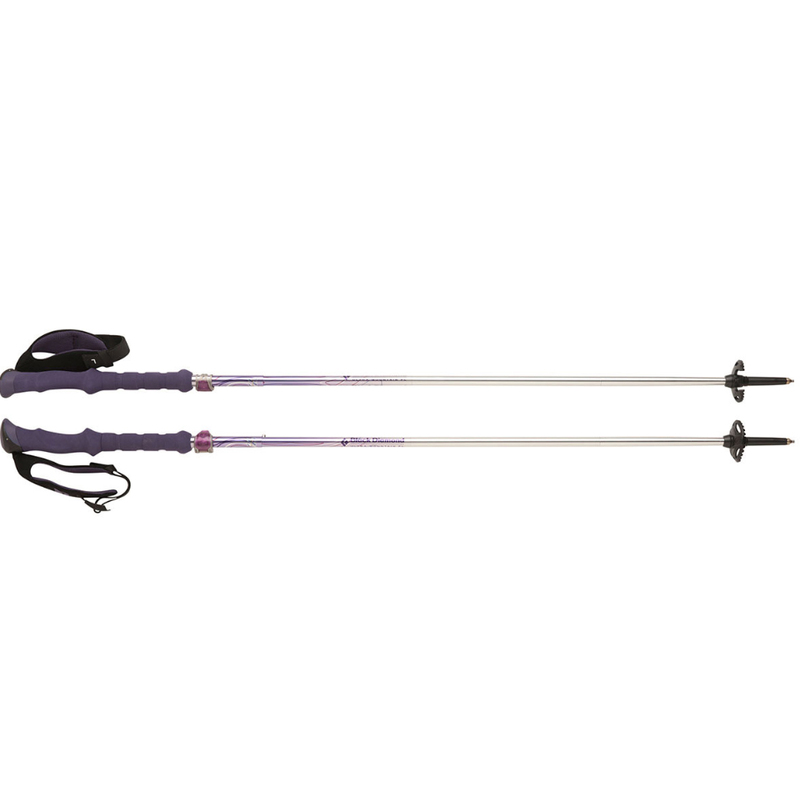 And as luck would have it the Black Diamond Ultra Mountain FL Trekking Poles came in purple! Black Diamond name the colour ‘amethyst’ but to me it’s still purple! These poles have a range of adjustment so you can get that Goldilocks ‘just right’ height for you. They also come in two sizes – 95-110 cm and 105-125 cm. I purchased the 105-125 cm size because that was the only size left on the shelf. While I adjust my poles down quite a bit, in retrospect it is the better size for me given I would otherwise be at the very upper limit if using the smaller size. Having said that, the adjustment range of 15 cm provides quite a lot of flexibility for hikers of small to average height. However, it is possible that taller hikers may not have the same level of comfort. These poles use Black Diamond’s Flick-lock Pro technology as the adjustment mechanism. It makes for quick and easy adjustment, and secure locking. The poles lock firmly into place and the aluminium construction is reliable and robust. The Ultra Mountain FL Trekking Poles have generous EVA foam hand grips. I find the size comfortable and they do tend to stay dry, However, when stored outside your tent overnight the EVA foam tends to soak up the drew which makes for a cool surprise when you start off in the morning. There are straps attached to the hand grips which are helpful over difficult terrain. These straps are also designed to fit the left or right hand which means you need to check you’ve got the correct pole for each hand before slipping the strap over your hand. This left/right feature adds to the comfort of the strap but it’s not at all problematic if you inadvertently mix them up. I tend not to use the straps all the time anyway. The biggest benefit of the Ultra Mountain FL Trekking Poles is the Z-Pole technology which allows you to fold the poles into three short sections that fit neatly into your pack’s side pockets. Folded down, the poles are a compact 35 cm in length. For packing away and storage, the Z-Pole technology also reduces the risk of a pole poking through travel bags or not fitting into your storage containers. I always get admiring comments when I get them out for use and I find them much more convenient to handle than traditional shrink down poles. The Ultra Mountain FL Trekking Poles are a great option for all hikers and backpackers doing any type of four seasons activity. These poles are now hard to find with newer models forever coming out. They are however a great choice if you can still locate them.